It’s a new season and a new era for the Mets. With the start of the 2019 season, the Brodie Van Wagenen era officially begins. If the style of former GM Sandy Alderson could be likened to the new school principal bringing order to the school hallways and discipline in the classrooms, Brodie’s persona is more of the inspirational life coach who’ll get you to hit the gym, believe in yourself, and start your own business. In contrast to Alderson, Brodie appears to be a more visible presence, at least early in the season. Prior to Sunday’s game, a 12-9 defeat at the hands of the Nationals, Brodie, in a sports jacket turned up at the collar, and Mets owner Fred Wilpon, in a windbreaker, chatted with each other and the players during batting practice, and afterwards he even greeted fans near the field. 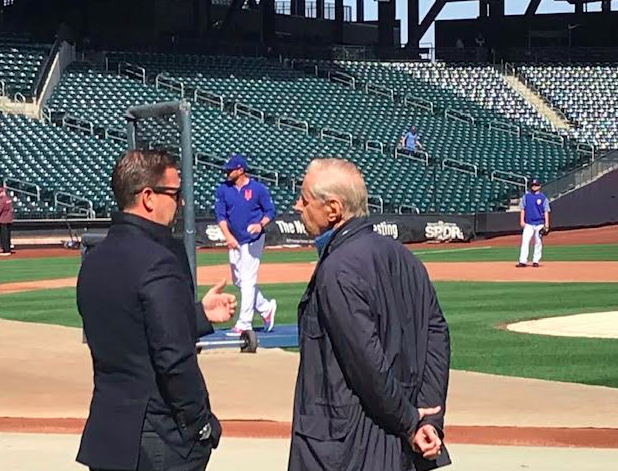 After batting practice on Sunday, I had a chance to chat with the new GM behind homeplate as he strided to the Mets clubhouse. Having chatted with Brodie about organizing the front office at the BBWAA Dinner in January, I asked how he was handling the day to day of the regular season, and he brightly said it’s been fun and when I asked if he’s thinking about moves he can make, he answered that he’s more focused on supporting the players by providing them with the resources they need to succeed, whether its proper nutrition or proper mental preparation. The new Mets GM exudes an infectious optimism and fans hope it translates into wins. 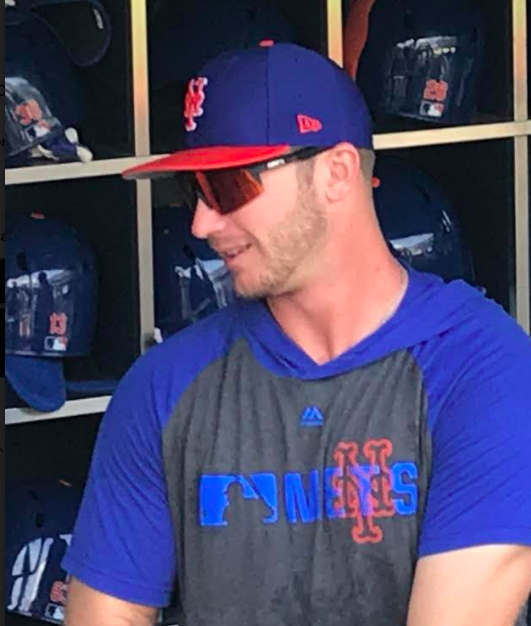 When he took on the GM’s role, Brodie said prized prospect Pete Alonso could be the starting first baseman in contrast to teams that have held back rookies to gain an extra year of contract control. Alonso was subsequently in the opening day lineup and has delivered with five homeruns, 14 RBI, a .385 average, and boundless energy in the early going. Two players the Mets are counting in 2019 are pitcher Zack Wheeler and outfielder Brandon Nimmo and both have started slowly. I asked manager Mickey Callaway prior to Wheeler’s start on Sunday about the impact of his expanded workload in 2018, and he said, “getting those innings under his belt was probably the most productive thing” for Wheeler and the team had a plan for rest and ramping up for him in the offseason. Callaway said Wheeler “understands what made him successful last year…and if he gets ahead at an elite rate with that great stuff,” he’ll be able to throw a lot of innings in 2019. Finally, after opening the season with 14 scoreless innings, Mets ace Jacob deGrom allowed six runs in four innings in Minnesota’s 14-8 trouncing of the Mets on Tuesday, thus ending his record-tying streak of 26 quality starts. The Mets Cy Young award winner will share the record with Hall of Famer Bob Gibson, though it should be noted, the term “quality start” did not exist in Gibson’s era, and if you told the ultra competitive Gibson that three runs in six innings was a quality start, he might’ve knocked you down with a pitch under your chin.